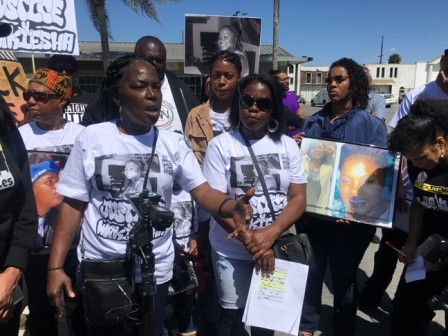 Wakeisha Wilson’s mother Lisa Hines and family, Black Lives Matter, One United Bank, and others marked the one year anniversary of her death in police custody with a march, rally, and big announcements in Watts on March 27. Participants marched from the Watts Labor Community Action Committee (WLCAC) to the Watts Towers and back. Poetry readings, music and artistic expressions enhanced the activities honoring Wilson. Kevin Cohee, chairman and CEO Black-owned One United Bank, announced the opening of a $10,000 trust account for Wilson’s son, 13 at the time she was killed. 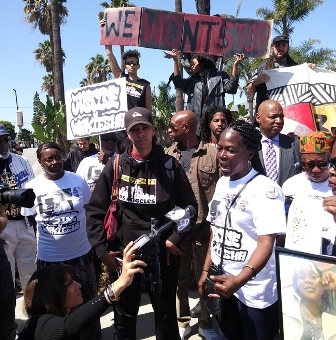 That same day, Congress­woman Karen Bass proposed a new bill named “Wakiesha’s Law,” which would mandate police notify families when there is a death in custody, said Dr. Melina Abdullah of Black Lives Matter Los Angeles told media during a press conference. 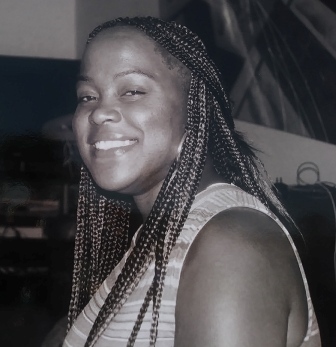 “Never again will we have a situation where a mother is sitting in court, waiting for her daughter, who’d been killed days ago,” said Abdullah as she reiterated Black Lives Matters demand that Mayor Eric Garcetti fire LAPD Chief Charlie Beck. From day one, he said his officers had nothing to do with Wilson’s death, despite their not being an investigation, said Abdullah. Wilson, who'd been arrested for a minor crime, was found in her cell at the Metropolitan Detention Center. According to police, the young mother committed suicide. However, she died from strangulation and was found lying on the floor, according to the family’s attorney. Hines, overcome with emotion, wept during the press conference. But her sister, Shiela Hines Brim spoke on their family’s behalf. She displayed a report she said Beck issued during a Police Commission. The report noted 20 minutes of video footage is missing, according to Hines Brim. “After a whole year, we have to seen a video. They won’t answer our questions … What happened during those 20 minutes that they had to edit, that they had to take out,” she said. She’s bitter, Hines Brim said, as she noted her niece was killed on her birthday. “We’re not going to give up. We’re not going to let this go down,” she said. “I have no words, really. My sister just said it all. She said everything I’m feeling, but it’s one thing for sure, that was my only child. My only child. ” said Lisa Hines after she regained composure. With conviction she stated she, too, was bitter and angry. “I’m a mad, Black woman … They killed my baby and then they lied about it. They tried to hide behind it. They didn’t want to tell me,” Hines said. The Los Angeles Police Commission ruled this Jan. 31 that no officers were involved. “We will not accept that. The people, the community and the family will continue to struggle for justice for Wakiesha Wilson, and we will do everything that we can to summon the energy and resources that we can to lift up the family to surround the family and to say that Wakiesha’s life matters, Wakiesha’s life will have a long standing impact on the justice that comes for all of the rest of us,” said Abdullah, who is also chair of the Pan African Studies Department at Cal State University L.A.
She expressed gratitude for the role of Wilson’s mother, aunt, and entire family and community. Cohen said One United’s mission is one of economic and social justice. That’s why it partnered with Wilson’s family, Abdullah, and Black Lives Matter in their journey to repair injuries that have occurred in their lives, he said. “As a community, we have the resources to do anything we want. We don’t need anybody’s help to do anything … We don’t need the government. We don’t need anybody to do anything for us. We can do for ourselves,” Cohee stated. “It’s just a matter of changing our mindset. It’s just a matter of coming to believe and understand who we are as a people and who we have supporting us as a people. We’re not alone in this journey,” he said. Abdullah emphasized that just because One United established a fund for Wilson’s son, the city, state, and public are not off the hook. “We need a reparations policy that is funded by the state. We don’t want four percent of our tax dollars in the City of L.A. to continue to fund police and neglect and deprive families,” she said.